Aftermarket Vehicle Services for Dealers of Autos, RVs, Campers, and More . 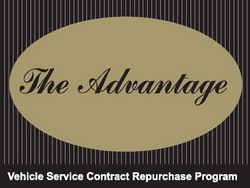 . .
What is The Advantage Repurchase Program? When a consumer purchases a new or used vehicle, one of the most valuable protection products is a Vehicle Service Contract which extends mechanical breakdown coverage beyond the term of the factory warranty. Many consumers reject the offer of service contract coverage because of cost. The Advantage eliminates this objection. If a mechanical failure occurs, the customer is covered, but if the VSC is not used, a complete refund becomes available to the customer when the contract expires. This makes the service contract not only the best protection available against major mechanical repairs, but with The Advantage Program, “If you don’t use the service contract, you don’t lose the money you paid for it.” Either way, it’s a win-win situation! The next time you buy an automobile or RV and you’re offered a service contract, make sure that you ask for a VSC Repurchase Certificate. You’ll be glad you did! Insured through the best "A" rated insurance company. Product available only through participating auto and recreational vehicle dealerships. © Copyright 2010. The Wildfire Group, LLC. All Rights Reserved.